Give her something special this Valentine's day... 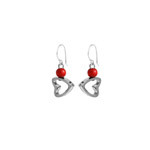 Treat the love of your life on February 14th with these heart shaped earrings with bright red wooden beads. Beautifully crafted in Scandinavia, the gorgeous red heart earrings make a perfect gift for your wife, partner or girlfriend and are an item of jewellery she can wear year after year. Made from sustainable materials, the red Romance earrings are great value - buy online now for just £12.90. See the full range of heart earrings in our wooden earrings range. Matching items are also available. Check out Arctic Fashion's Romance bracelets by Aarikka in our wooden bracelets range.